An oil spill in Montana on the long weekend in the US---and there's a flood situation with the Yellowstone River. People had to evacuate and the oil company will do the cleanup. Are we going to see another round of Dawn dish detergent ads to get donations to clean up the wildlife affected and oiled by the spill? It may look a little silly but these woollen sheaths are knitted specifically for penguin victims of oil slick disasters. Napier-based Skeinz Natural Yarn Store has knitters going like the clappers to make the penguin jumpers for the Bay of Plenty disaster. General manager Brendan Jackson told NewstalkZB three to four dozen penguin outfits are likely to be needed. The knitwear prevents the birds from preening their feathers and ingesting the toxic oil that they've been exposed to. The Oiled Wildlife Response Unit is taking care of 91 animals as a result of the spill, mostly little blue penguins. Hadn't seen the yarn clothing on penguins before. Does the oil itch their feathers while the clothing is on? Back to last year's BP oil spill--a journal article published on a study of the water affected by the BP oil spill indicates the existence of a negative reproductive factor for the marsh land and marsh creatures. What kind of results have you found in the fish? We collected fish that were in the marsh before, during the height of oiling and after the oiling started to subside a little bit. What we found is, and particularly our Louisiana site, we started finding some very large genetic and protein level effects. What we are finding is major changes in the gene products that have implications in reproduction and development. We are also finding there’s a unique signalling pathway, what’s called an aerial hydrocarbon receptor, it’s classically turned on by crude oil exposure, we are finding that all of these effects are increased … activation of this gene pathway has been shown to be predictive of exposure to sublethal concentrations of crude oil, and also an increase in this gene pathway has been shown in the Exxon Valdez spill to have negative population levels, impacts on fish, sea otters, birds and so on. To many oil spills from a number of ships, over a number of years. The birds to animals that live in those waters as the ones the suffer if not the end of their lives in a while. There is a lot of talk about double hull ships if they are carrying oil, but not very few as of to date due to COST. There is also a bit of an uproar about the crude oil that is to be sent from the Cdn Athabaska Tar Sands to Texas, for we have see some oil line spill on previous years that are ghastly. Keystone XL is the pipeline project that Canadians and Americans have been filmed and interviewed for during protests of recent weeks. 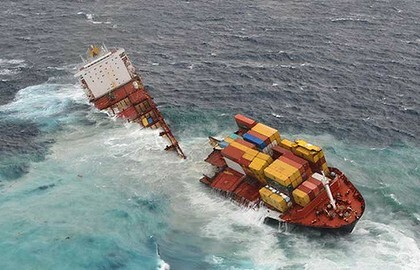 Speaking of oil, New Zealand's had bad weather hinder cleanup of the Rena. The mention of the ship's crack getting bigger--time to get that listing cargo off deck to release strain on the hull? Shipping in the area has been affected too. One happy ending after the Rena oil spill. Some penguins have been cleaned up and released back to the wild and hopefully an uneventful life. They have already had enough drama to last a lifetime. The release of 60 penguins at Mt Maunganui beach today is a significant milestone in the Bay of Plenty's recovery from the Rena oil spill and environmental disaster, Environment Minister Nick Smith said today. "It is a heart-warming experience after the devastating scene of oiled and dead birds to see these healthy penguins returning to their natural habitat," Dr Smith said. Another New Zealand creature is getting a partial return to its habitat-rare dotterel birds. Of the 60 birds that were taken into a refuge, 30 birds were returned to a cleared beach. The remaining birds are being kept until the other beach areas are cleared. December 4, 2011 — Maketu, New Zealand (Reuters) Rare birds released back into the wild, after being saved from the oil spill caused by the stricken ship, Rena. Rescuers were able to round up half of the local dotterel population Fifteen rare dotterel birds were released back into the wild near the town of Maketu, New Zealand on Saturday (December 3), after previously being rescued from the oil spill caused by the stricken ship, Rena. The oil spill, the penguin release then the earthquake. Nature is certainly taking stock as the challenges occur to people and to creatures alike. Last I read, Nigeria was dealing with an oil spill approaching its coast last week. Oil pipelines leaking there are always problematic because of the need for repair and the fact that some individuals seek to profit from getting some oil from the lines without authorization. The oil industry is big business with many, many connected issues. After oil, what is the next biggest industry in the country? The cargo ship that had problems in New Zealand and caused an oil spill? The ship itself is now two pieces. Worries mount. To minimize looting of cargo coming ashore, beaches have been closed.